Sometimes, you have to take on the small stories: Enjoy! Sorry for the sluggish blogging, working on about five stories right now. Stay tuned to see them! Construction of the new Rose-McQuillan Cultural Building at Fairchild Tropical Botanic Garden in Coral Gables is about to start, now that its biggest obstacle, a 75 foot haldina cordifolia tree, has been safely transplanted. The new one-story building will include an art gallery and display archival and historical information about Fairchild Garden. The tree was originally collected in 1937 in India by Walter Koelz, from the U.S. Department of Agriculture. The tree, which was planted by David Fairchild 75 years ago, is the only one of its kind in the United States. Fairchild was a famous plant explorer who searched for useful plants. The transplanting process was rigorous and took a year to complete. It was completed on Monday. 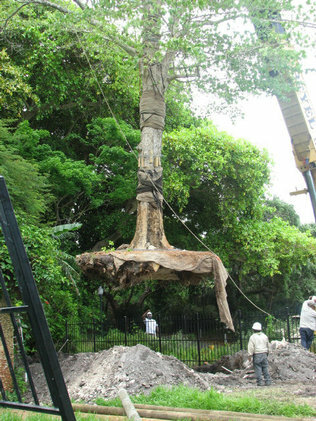 After an expert tree-transplanting team pruned the giant roots over 12 months, two cranes were used to successfully relocate the tree to the Fairchild Arboretum. Because of the tree’s size, it could only be moved within the cranes’ reach. ← Multimedia Advice: Just do it.